So it was on one of those gray, foggy days on the Pacific NW coast. Morning dawned semi-cloudy, then on and off the fog rolled in, reminding us of the proverbial NE “pea soup,” but thicker. The ocean seemed to be taking a Fall reprieve, resting calmly, with glassy rolling waves, but no swell to speak of. With the air temp in the low 60’s and the water about 7 degrees cooler it seemed a good day to hike the dune at Cape Kiwanda and call it good. 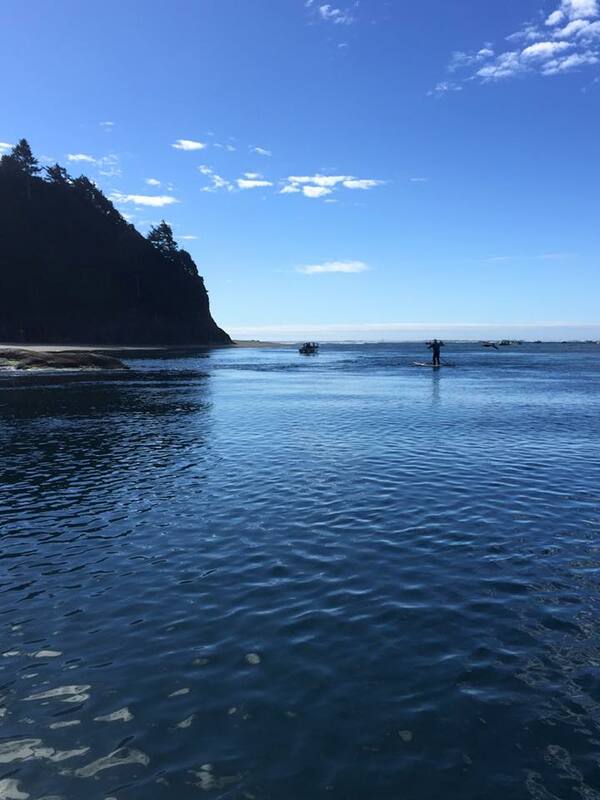 But when you’re 67 and you live 4 hours from a coast and winter is breathing hard down your neck – well, you put on the wetsuit and hit the water. It’s like almost everything else in life, half the win is simply showing up. So, while shivering on the beach I pulled on my 4/3 Rip Curl wetsuit (love its color and style, softness and ZIPPER) and put on my leash. 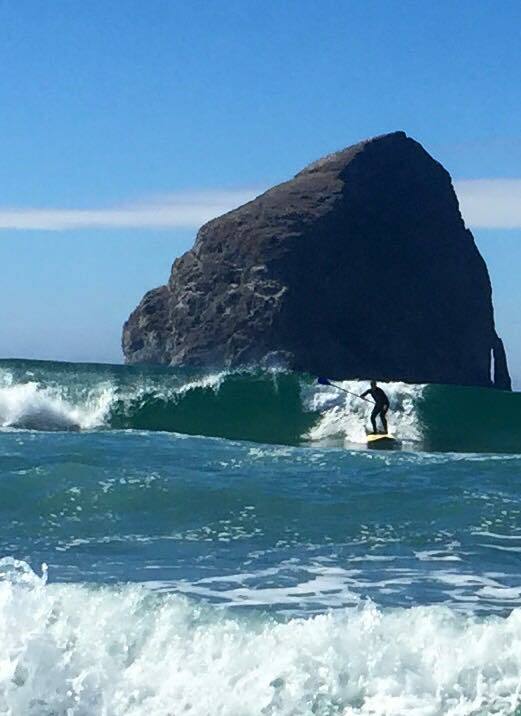 Swell or no swell, I was going out to whatever the break at Pacific City had to give. I could not even see the HUGE haystack rock that sits like a crown jewel off the beach because the fog had gobbled it up. Because of that, it was difficult for me to determine my favorite spot to wait for a swell to roll in. Over time I drifted further and further south. I don’t usually head in that direction but the fog had left me without the usual bearings. So cool! Swells were rolling in over there. They were chest to head high and glassy beyond all hope. 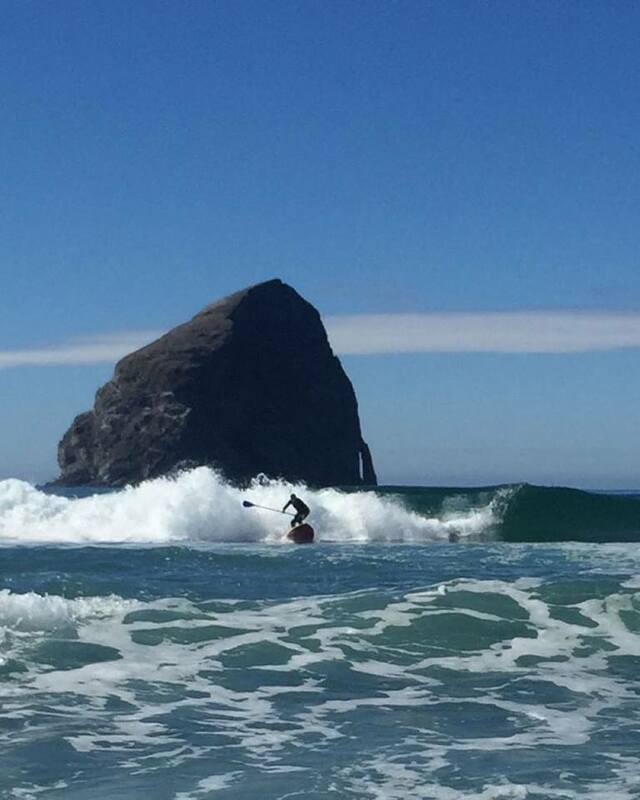 While the wait between swells was seemingly long, the reward was worth it – also the chat among all of us (prone and SUP). There were dozens of prone longboard riders out in the lineup. Usually I hunker over to a shoulder of the swell to keep my standup out of the way of the prone surfers, but on this day the stoke was warm – and that was cool! Very cool.We all bantered about the weird weather and the length between sets. 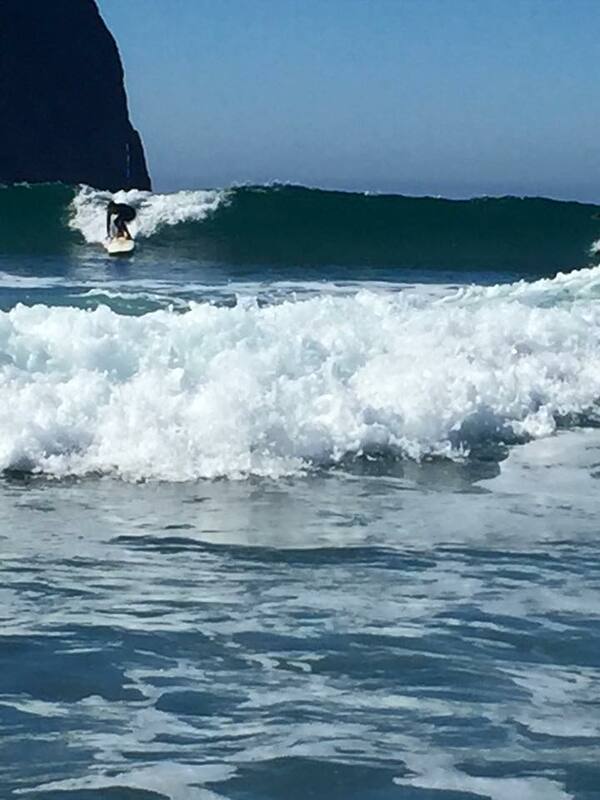 There seemed to be room for all on the waves that came through. Share and respect made the day! 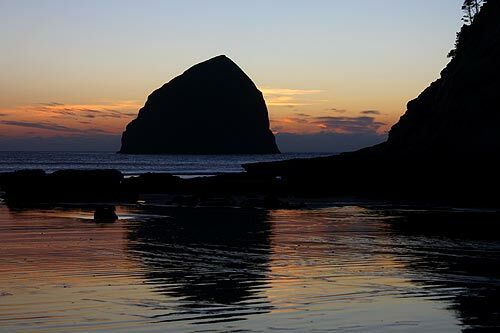 As we close every day at Pacific City we wandered down to the beach for a beer and sunset. The afternoon drizzle didn’t deliver a sunset, but the view was magical just the same. The magic at our favorite beach, our top ten break – all in the eye of the beholder. Actually, it’s not a problem. 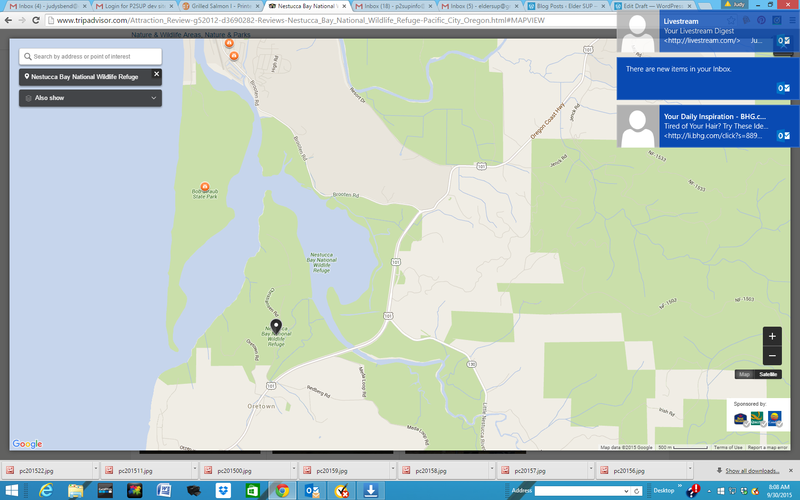 The RV sites we have found have been STELLAR. Last night as the winds roared wild from the south, gusting to 50 or more, we slept soundly at Harbor Vista Park (Lane County) outside of Florence. 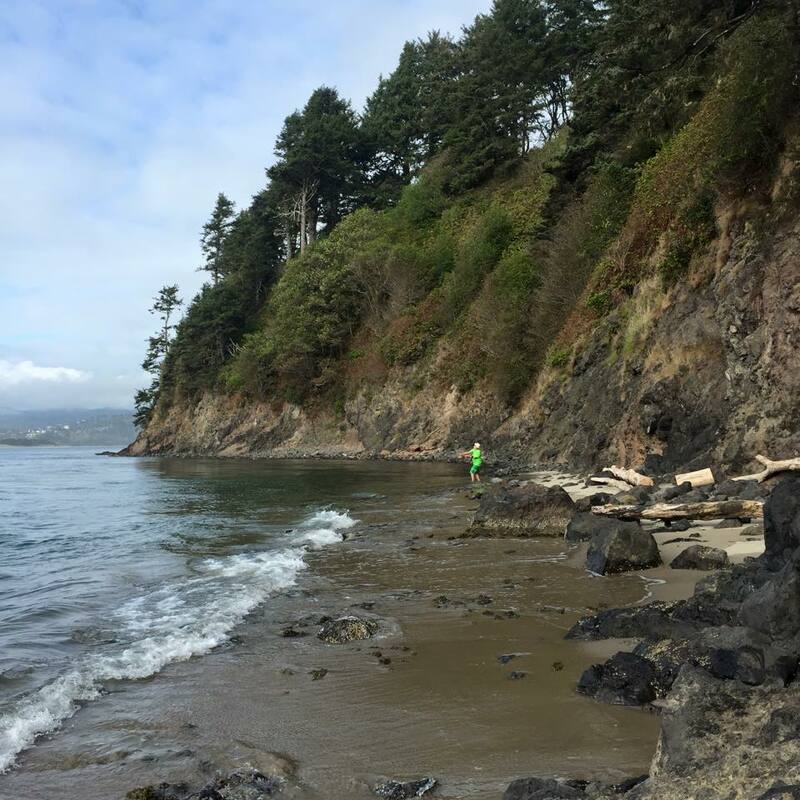 If you plan to go there you will be happy with any site, but for unobstructed ocean views – plan ahead and try to get #13 (secret awesome tip). 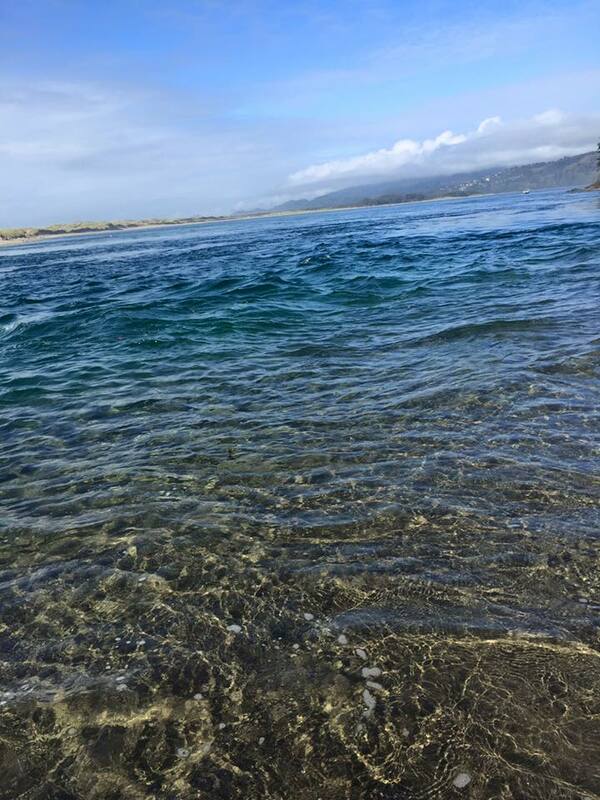 Just a short walk from the site you’ll find a great hike to a wide area where the Siuslaw River joins the Pacific. Seals play and so will you. Today we worked our way down to Harris Beach State Park in Brookings. Along the way we saw a sign with flashing lights that said, “GUSTING WINDS next 27 miles” – what were we supposed to do? We drove on. Later we saw a sign that said “high water,” and a mile down the road we were pushing a pretty big bow wake with our truck and trailer. We arrived at Harris Beach State Park and scored an awesome, ocean view site (bonus tip – A 18 can’t be reserved but try to get it). Right now we are being hammered by a powerful storm band, but again, we are loving the ocean view right from the couch where I’m typing. Within a 30 minute walk in any direction there are rocks and views we plan to absorb over the next week. Our Naish Hokuas are still wrapped in their board bags, the surf is chaotic and huge. 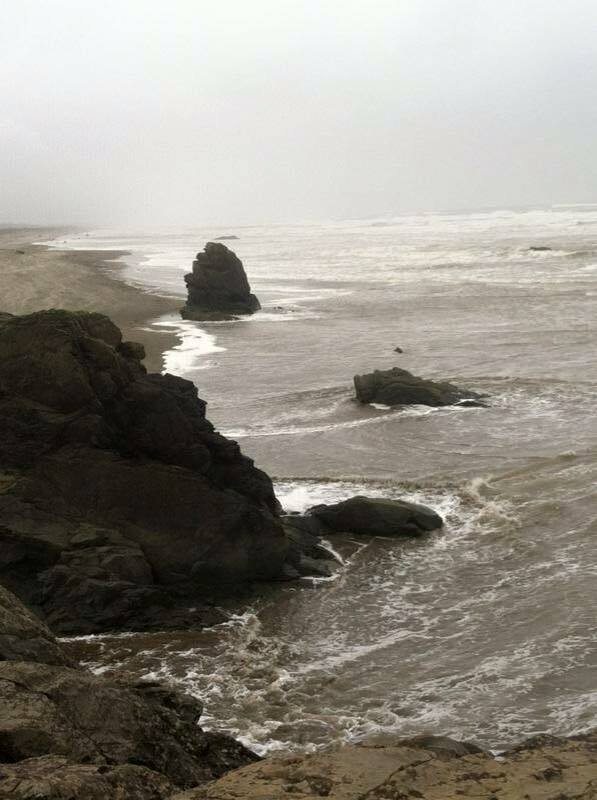 The rivers are pouring muddy fresh water into the sea, so surfing is not particularly inviting or safe. That said, the beaches in this area could not be more picture postcard perfect. 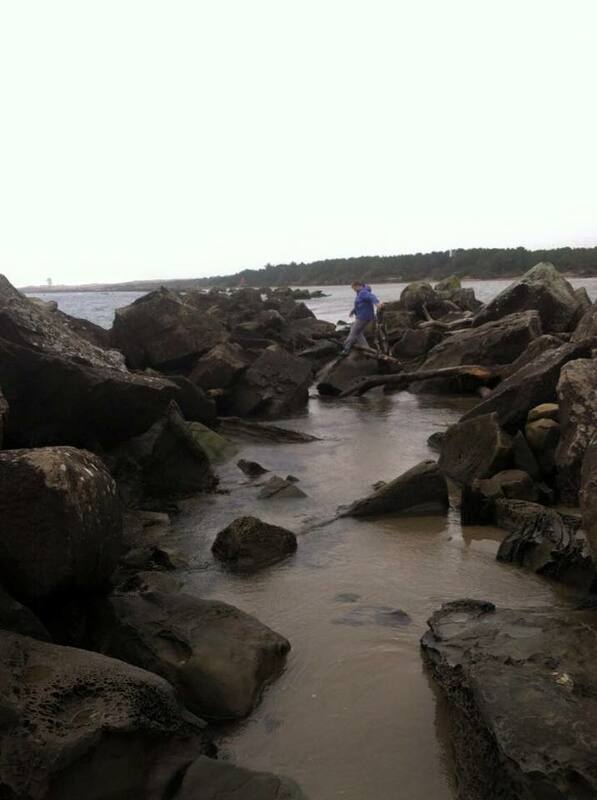 As we drove through Bandon we took a shoreline detour and found a great beach walk in the Devil’s Kitchen area. 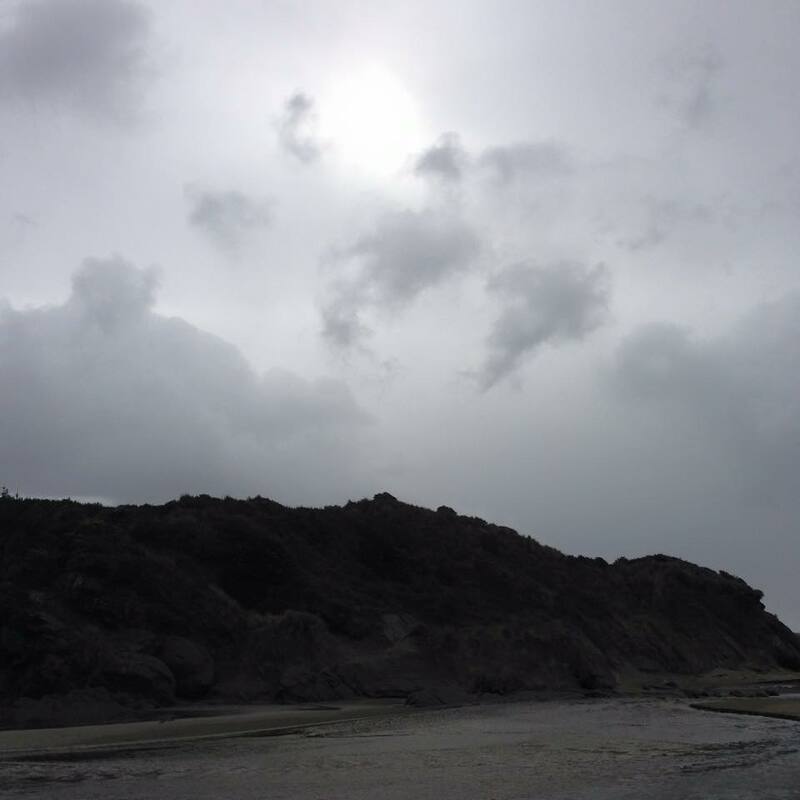 The sun came out, creating a monochromatic scene. 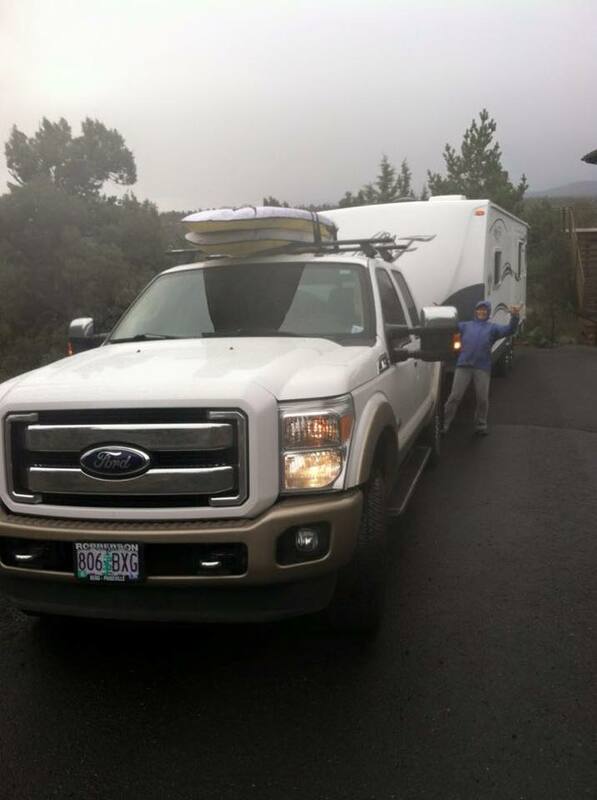 So, until the weather clears we will spend some time watching H2Mexico and The SUP Movie while the rain pelts us. But don’t worry. We are well fed and pretty happy. 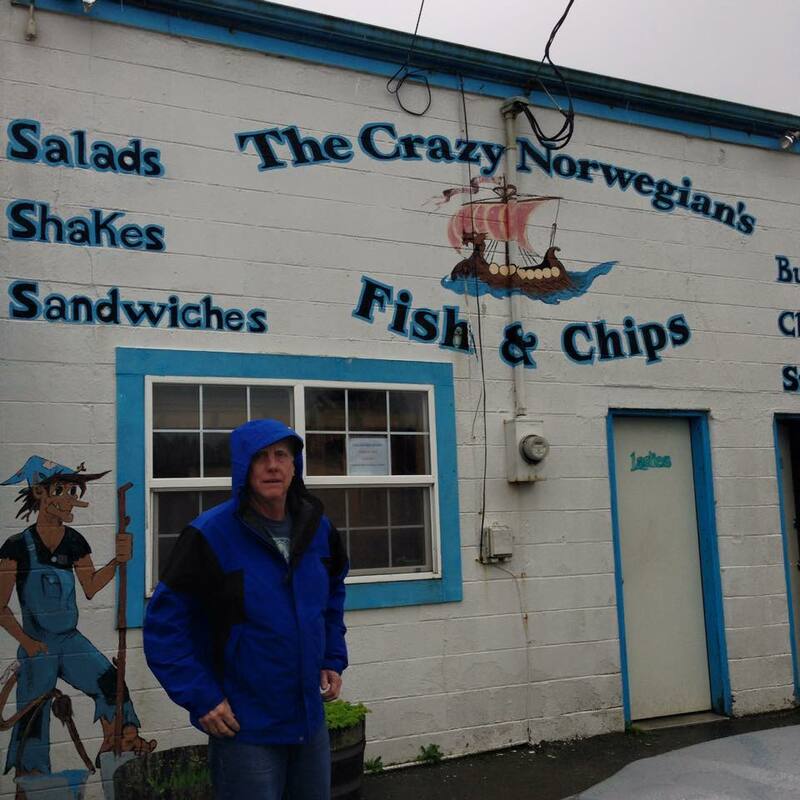 We had a yummy fish and chips at the warm and cheery Crazy Norweigan restaurant in Port Orford. As the evening evolves, a nice bottle of Beaujolais-Villages keeps me calm while the trailer wiggles from time to time. But tomorrow – the BIG storm band is on its way. By noon the weather man predicts the worst of the storm will be upon us and winds will be blowing off the chart. Stay tuned.